Good oral hygiene is of the utmost importance. It not only helps our teeth and gums, good oral hygiene contributes to your overall health. It’s important that we develop good habits and routines when it comes to oral hygiene. How do you ensure that your mouth is as healthy as possible? There are many different answers to this question, several of which are covered below. Here are some keys to good oral hygiene in Sauganash, Illinois. The number one driver of good oral hygiene is brushing your teeth regularly. Ideally, you should brush your teeth after every meal or snack. However, brushing your teeth once in the morning and once before bed is a good practice. When brushing, it is important that you use proper technique. Failure to use proper technique can result in receding gums, gingivitis, tooth decay, and other problems. Don’t brush too hard, as this can severely damage the gums over time. Utilize short circular strokes, focusing on one or two teeth at a time. Make sure to brush all sides of each tooth, and angle your brush toward the gum line. If you’re unsure about your technique, don’t hesitate to ask your dentist or dental hygienist. A good toothbrush has soft bristles that don’t feel abrasive against the teeth and gums. Changing your toothbrush every 3 months is recommended to ensure proper removal of plaque. Using an electric toothbrush is highly recommended. Some designs even notify you when too much pressure is being applied while brushing. 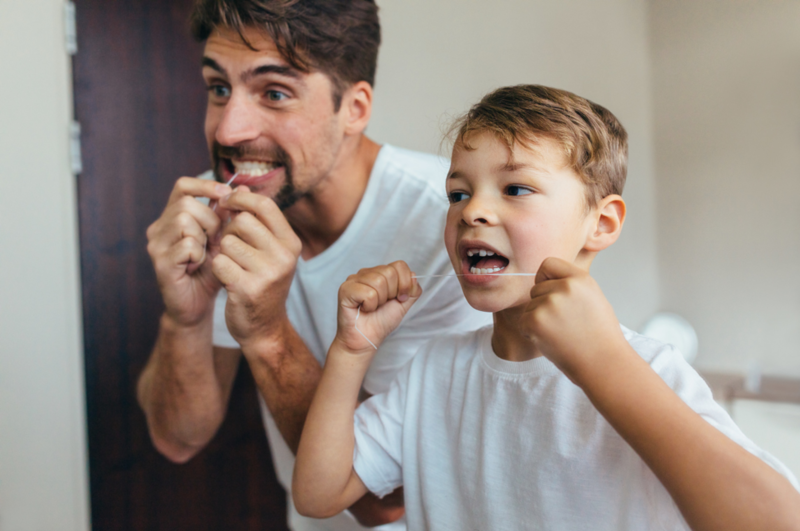 Brushing and flossing will go a long way in maintaining good oral hygiene. However, there is more to good oral hygiene than just active care. To protect the health of your teeth, it’s also good practice to abstain from eating foods that are known to be detrimental to oral health. Eating a large amount of these foods is a fast track to tooth decay. While you can certainly indulge in such food occasionally, it should be treated as an occasional treat, and not as part of your regular routine. Foods and drinks to avoid include soda and other sugary drinks, candy, potato chips, and alcohol, to name just a few. If you’re a smoker, you’ve probably already heard the warnings: smoking is extremely detrimental to your health. Unfortunately, this includes oral health as well. Not only does smoking cause your teeth to become discolored, it also poses a threat to the soft tissue in your mouth. Smoking greatly increases the risk of developing oral cancer. While everyday care of your teeth and gums is extremely important to your oral health, it’s also wise to have your teeth checked and cleaned by a dentist twice yearly. A dentist will inspect your mouth closely, looking for tooth decay, gum recession, and any other problems that may be present. By inspecting for these conditions, your dentist can catch small problems before they become big ailments. Looking to Schedule a Dental Appointment in Sauganash, Illinois? Interested in scheduling an appointment with a dentist in Sauganash? If so, the dental professionals at Dental Innovations are the people to see. Lead by Dr. Thomas Murray, we provide our many patients with proactive, preventative and comprehensive dental care. It is our goal to maintain the quality of your teeth and gums and keep you as healthy as possible.